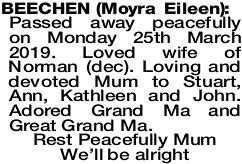 Passed away peacefully on Monday 25th March 2019. Loved wife of Norman (dec). Loving and devoted Mum to Stuart, Ann, Kathleen and John. Adored Grand Ma and Great Grand Ma. 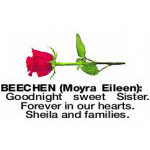 The Funeral Service for Mrs Moyra Beechen of Bull Creek will take place in our Chapel 312 South Street, Hilton commencing at 2:30pm MONDAY on (8.04.2019). 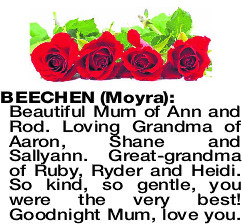 BEECHEN MOYRA Beautiful Mum of Ann and Rod. Loving Grandma of Aaron, Shane and Sallyann. Great-grandma of Ruby, Ryder and Heidi. So kind, so gentle, you were the very best! 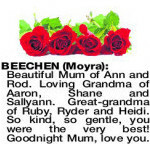 Goodnight Mum, love you. Goodnight sweet Sister. Forever in our hearts. Sheila and families.